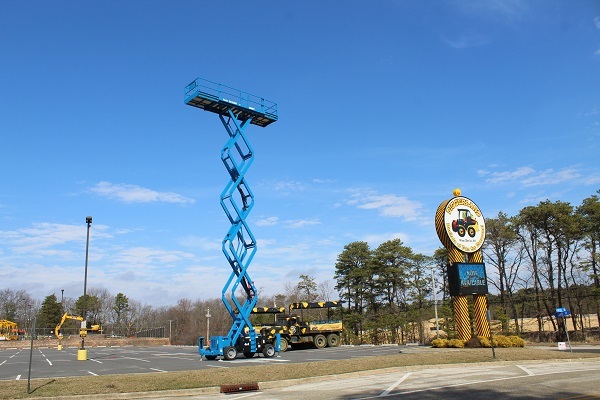 For the average person, taking a joy ride up in an aerial scissor lift, traditionally used in building maintenance, warehousing and construction, might just be a fantasy. Leave it to Diggerland USA to make dreams come true with its release of the third out of five new attractions being added for their upcoming 2018 season. “Elevation Station,” which seats five guests across a 6-ft wide by 20-ft long operating platform, will raise the thrill seekers up into the sky, reaching a maximum height just under 60 ft.
Diggerland USA is America’s first and only construction-themed adventure park, allowing children and their families to drive, ride and operate real heavy machinery in a safe environment. The park, which opened in June of 2014, began a multi-million dollar expansion at the end of their last season. Diggerland has been releasing a slew of unique attractions for their upcoming 2018 season, including the recently debuted Soaring Eagle Zip Line and Ventrac Tractors. The addition of Elevation Station will be no exception to the remarkable experience Diggerland provides. Last month, the park challenged fans to generate a name for the modified Genie GS-5390RT rough terrain scissor lift, manufactured by Genie, a Terex brand, out of Redmond, Wash. Over 300 people commented on a Facebook post with their suggestions. After review and a vote from the park staff, Jennifer Dunn’s suggestion of Elevation Station came in as the winner. “My kids and I discussed a few names, the first of which incorporated scissors in the title. We ultimately decided on Elevation Station because the lift resembled more of an elevator going up and down. We are so elated that we won!” Dunn said when she found out her name was chosen. “At its maximum height our guests will be able to view all of Diggerland, the surrounding forest, businesses, and homes. On clear days, you can view the Philadelphia skyline to the North-West. The entire team is extremely excited to introduce another attraction at our location that is unique to the amusement industry and gives the guests a hands-on experience unduplicated anywhere else in the world,” said Josh Karu, operations manager. Elevation Station features a diamond plate deck, which holds five passengers and a ride operator. The unit itself weighs over eight tons and is elevated vertically with two main hydraulic cylinders powered by a 48-hp diesel engine. The ride will be available for guests who are at least 36 in. in height to ride with an adult, or at least 42 in. tall to ride alone. Check out more Diggerland USA news here.